ALEXANDRIA, Va. — One congressman was up before the sun, riding his bike 9 miles, across the Potomac, to take batting practice. Another brought his 10-year-old son to watch. They wore ball caps and T-shirts, caught pop flies and fielded ground balls, a quiet, innocent respite amid a political season that was anything but. And then gunfire rang out, surreal blasts amid the soft thwack of mitts and bats. One of the GOP representatives went down near second base, leaving a bloody trail behind as he dragged himself away from the shooter into the outfield. As the burst of gunfire continued, others ran for cover and dove into the dugout behind first base. 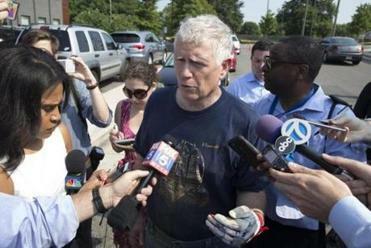 The attack by a lone gunman on Republicans practicing for an annual ballgame against Democratic colleagues wounded a congressman, a congressional staffer, a lobbyist, and a Capitol police officer. It also deeply shook a national capital that was already balancing on what often seems to be a razor’s edge. Now, even a baseball practice, a time-honored ritual that remains one of the few activities left in Washington that bridges ideological divides, was subject to irrational political hate and the horror of a mass shooting. A rifle-wielding attacker opened fire on Republican lawmakers at a baseball practice Wednesday. The scene unfolded early Wednesday morning as Republican members of Congress gathered at Eugene Simpson Stadium Park for their daily baseball practice. The next night, they would take the field against Democrats at Nationals Park for a night of bipartisan bonding and charitable good works. The practice field chosen by the Republicans sits next to a YMCA in a neighborhood of Alexandria known for its renowned frozen custard shop, its street festivals, and its tight-knit community. As the team turned from field practice to batting practice, two congressmen decided to head back to Capitol Hill to beat the traffic. As they were leaving, a man approached. Are these Republicans or Democrats out on the field, he asked. “Republicans,” responded Representative Jeff Duncan, a South Carolina Republican, who later recounted the exchange. That man was later identified as James Hodgkinson, a 66-year-old from Illinois who has a long record with law enforcement as well as a well-documented and politically charged opposition to President Trump. “Trump is a Traitor. Trump Has Destroyed Our Democracy. It’s Time to Destroy Trump & Co,” he had written on Facebook, on a personal homepage that featured photos of Senator Bernie Sanders. On each morning in recent weeks, Hodgkinson frequented the YMCA that sits adjacent to the ball field, according to a report in The Washington Post. And on Wednesday just after 7 a.m. — after he asked the two congressmen who was out in the field — the first shot rang out, from somewhere behind the third-base dugout. House majority whip Steve Scalise, a Republican from Louisiana, fell to the ground at second base. He screamed out in pain. He began crawling into the outfield for some 15 yards, trying to get away, a trail of blood behind him. Those on the field frantically searched for cover as the shooter targeted them with an assault rifle. Bullets whizzed in rapid succession. Marty LaVor, a Washington-based freelance photographer who was taking pictures of the practice, scrambled into the first-base dugout. Brooks, the congressman, first hid behind the batting cage, but then was worried he could be exposed if the shooter changed positions. So during a pause in firing, he and others raced to join lawmakers and staffers in the first-base dugout. “We’re breathing dugout dust, face-first down,” Brooks said. A dozen others were there. Some got on cellphones, calling for help. 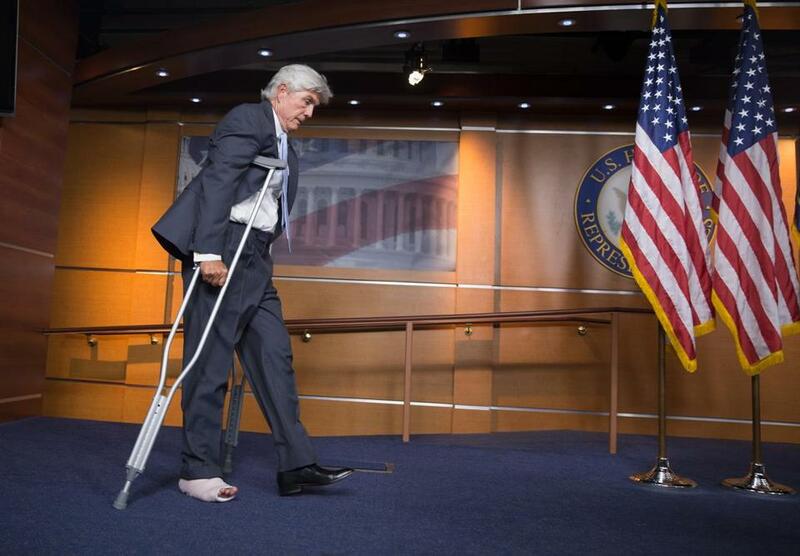 Others turned toward Zack Barth, a congressional staffer who had been shot in his calf. Brooks ripped off his belt and someone else began using it as a tourniquet. Casualties would have been worse, said witnesses, if it had not been for happenstance. Two armed Capitol Police officers were at the scene to provide security for Scalise, a member of top House leadership. The officers fired at the gunman as the congressmen taking cover in the dugout could only look at Scalise, who lay motionless in the outfield. “The shooter is down,” someone eventually said. Senator Jeff Flake, a Republican from Arizona, immediately ran out to Scalise and used his hands to apply pressure on his wound, where he had been shot in the hip. Representative Brad Wenstrup, a Republican from Ohio who is a podiatrist in the Army Reserves, cut away Scalise’s uniform and applied gauze. Scalice was conscious and asked for water. As soon as Scalise was in the ambulance, Flake got Scalise’s cellphone and called his wife, delivering the news before she heard about it from the media. Flake, still in his red uniform with “Republicans” emblazoned on it, was visibly shaken as he recounted the morning to reporters at the scene. Brooks, with his Rawlings batting glove still on his left hand, also recounted his shock, as he stood about 100 yards from a baseball diamond that had turned into a crime scene. Glass was shattered in the nearby YMCA windows. A black SUV parked nearby had a broken window, too. Donna Bernstein, who was at a neighboring gym when gunshots rang out, said she walked outside around 7 a.m. and witnessed the commotion of first responders. She was dismayed to learn that a gunmen had targeted the group. “We’re going in the wrong direction,” Bernstein said of the country, her head hanging in sadness. It also did not take long for partisan blame to creep into the debate. Representative Steve King, an Iowa Republican, said the political culture driven by the “left” created an environment where violence against elected leaders was possible. King learned about the shooting while in a meeting with other members of the House Republican conference. President Trump, during remarks at the White House after the incident, stuck to a more unified tone focused on the heroism of the police and the hope for Scalise’s recovery. News emerged that Hodgkinson was a volunteer on Senator Sanders’ presidential campaign. The mood on Capitol Hill was somber but also one of resolve to convert the incident into something positive. Some want the dialogue to improve. There’s talk about whether security needs to be enhanced. And nearly all were adamant that the baseball game will be played on Thursday night. 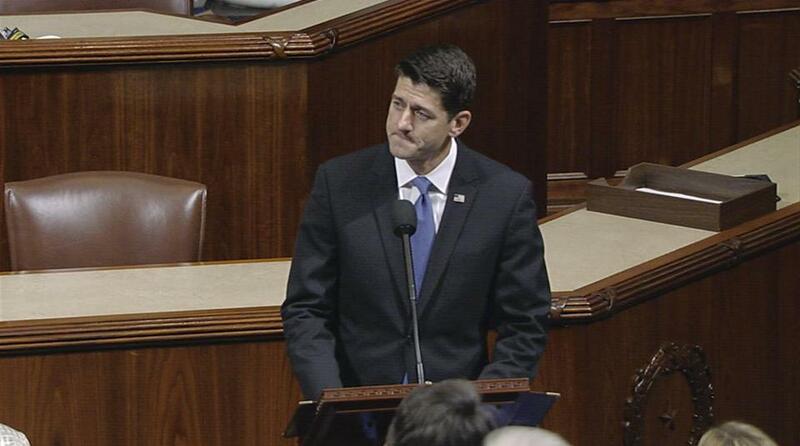 House Speaker Paul Ryan gave a powerful speech on the floor about five hours after the morning attack. The room rose, with members of both parties standing in ovation. Matt Viser can be reached at matt.viser@globe.com, Annie Linskey can be reached at annie.linskey@globe.com, and Astead W. Herndon can be reached at astead.herndon@globe.com.